One of the important tasks in an ETL process which supports a Datawarehouse/DataMart is to load data into dimension tables. As per Kimball methodology there are three types of Dimensions like type 1, type 2 and type 3. The most discussed and often implemented is the Type 1 and Type 2 Dimensions. To get a quick overview of the two types: Type 1 dimensions are usually static, in case there are updates the old values are just overwritten. In case Type 2 or slowly changing dimension there is usually a historical record of what changed in the Dimension. A good example of this could agents working for a Team Manager in a Call center. A agent could have his Team Manager re-assigned and this change would have to captured in the data mart and that is where Type 2 dimensions come in. 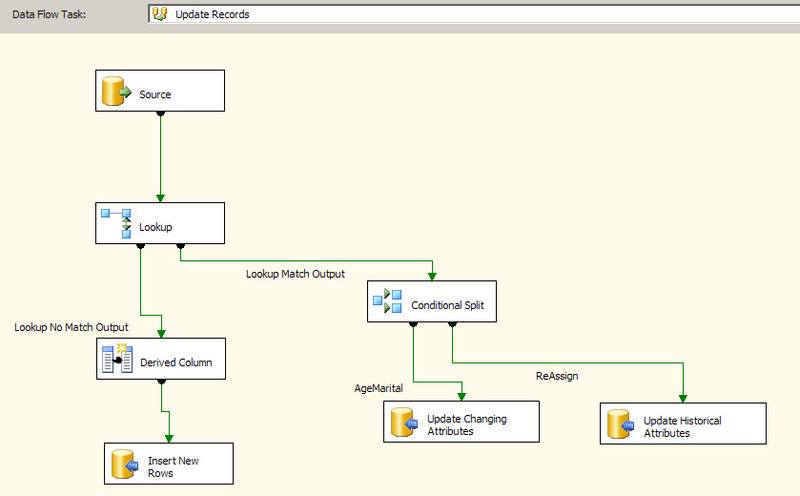 In SSIS in order to facilitate the loads of Type 1 and Type 2 dimensions, we have the SCD wizard which can be used. On walking through the wizard, one can set up Changing attributes and Historical attributes. Once this task is finished, a data flow is generated to handle Type 1 and Type 2 Dimension loading. In the image below one can notice the OLE DB Command Component being used by SCD component. As it has been discussed in a lot of articles,blogs, the SCD component does not scale very well. There have been performance issues with using the SCD component straight out of the box. One of reasons could be the fact that the SCD component uses the OLE DB Command component to perform updates of rows, these rows are updated one row at a time. The time to update the rows can significantly increase if there are a lot of changes that are to be processed. In fact even while performing incremental inserts or updates to tables in general OLE DB command component can take up quite a bit of time in order to process the rows. One of the methods to alleviate performance is to use a temporary/staging table where in all the changes are loaded in the destination database. 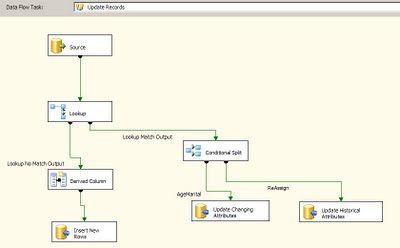 Once this data flow is complete, use a stored procedure to merge the changes into the actual destination table. 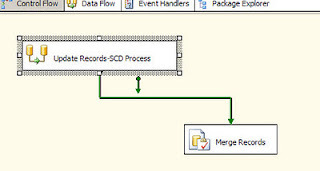 In the Stored procedure one could take advantage of the MERGE T-SQL command to insert/update records into the destination table by using the temporary/staging table. In the image below one can notice that the OLE DB Command component has been replaced by the OLE DB Destination component. 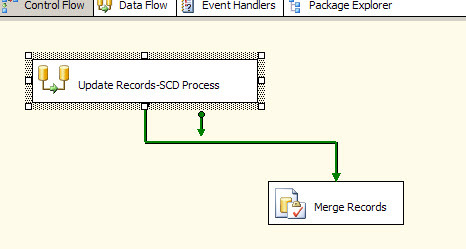 To finish this up, in the contro flow we would have a Execute SQL task to perform the Merge operation. Here is a visual of the Flow.